Georges Michel (1763-1843). Michel was born in in Paris. He came from a humble background, his father being an employee at the market of Les Halles. At an early age, Michel worked on a farm in the Saint-Denis region, north of Paris, where he first developed his interest in the countryside. In 1775, he was apprenticed to a mediocre history painter, but he preferred to sketch outdoors. A colonel of the Hussars engaged him in his regiment, garrisoned in Normandy, and arranged for him to take further lessons. Michel remained there for more than a year, after which he returned to Paris. Later in 1798, Michel left for Switzerland, and also visited Germany. The art dealer Jean-Baptiste-Pierre Le Brun authorized Michel to copy the seventeenth century Dutch paintings that were in his shop, and was, in a way, very responsible for the artist’s further artistic development. In 1791 Michel debuted at the Salon, where he continued to exhibit regularly. Nevertheless, critics ignored Michel, considering his works too similar to those of the Dutch masters. Around 1800, Michel was employed by the Musée du Louvre to restore their Flemish and Dutch paintings, and it was in this capacity that he developed a true understanding of the technique of his predecessors. In 1808, he decided to set up a studio and give lessons, but he stopped teaching the following year. In 1813 he opened a shop adjacent to his studio and sold furniture and paintings. He exhibited for the last time at the Salon of 1814. After the death in 1820 of the last surviving of his eight children, he left Paris to stay for one year in Picardy. After his return, he began to live a reclusive life and gradually withdrew from the art world. Because of his self-imposed artistic isolation, Michel had to rely solely on the patronage of the Baron d’Ivry, who purchased almost his entire output until 1830, when the two men had a falling out over political differences. Michel always painted within a small area limited to the surroundings of Paris. He commented that ‘whoever cannot paint within an area of four leagues is but an unskilled artist who seeks the mandrake and will only ever find a void.” His preferred locations were Montmartre, where he was inspired by the famous windmills, the plains of Saint-Denis, the villages ofVaugirard, Grenelle, Montsouris, Romainville and Le Pré-Saint-Gervais. His small plein air studies were often drawings heightened with watercolor wash, which were then used as preliminaries for paintings worked up in the studio. His career can be divided into three phases. The first, until circa 1808, includes the period of his collaboration with Jean-Louis Demarne and Jacques-François Swebach, artists who often executed the staffage of his landscapes. Later he developed a more personal vision, in which light and treatment of the sky and space became his principal concern. His paintings became more unified compositionally, with vast expanses of landscape and wide perspectives under stormy skies. 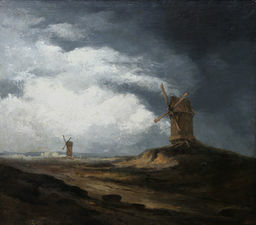 The windmills are often the sole accents punctuating the compositions. After 1830 he was at the peak of his talent. His style became even more lyrical and visionary, his brushstrokes broader and his paint thicker. He reinforced the dramatic tension by accentuating the heaviness of the skies and the contrasts of light and dark. Michel had little interest in fame, and with the exception of a few early paintings, his works are unsigned. Michel meant that the quality of the painting should speak to the beholder, and not the signature. He never achieved success during his lifetime and in 1841, two years before his death, the contents of his studio, consisting of more than 1000 studies and 2000 drawings, were put up at auction. The Barbizon painter Charles Jacques acquired several of his works, and other artists from this group, like Jules Dupré, were much inspired by Michel. His importance is more as a precursor of the works of the Barbizon school, while his own oeuvre has not yet been given the full attention that it deserves. Amiens; Baltimore, Walters Art Museum; Bayeux; Beauvais, Musée départemental de l’Oise; Béziers; Bordeaux, Musée des Beaux-Arts; Boston, Museum of Fine Arts; Brest; Buffalo, NY, Albright-Knox Art Gallery; Carpentras; Chicago, Art Institute of Chicago; Cleveland Museum of Art; Dijon, Musée Magnin; Hanover; The Hague, Museum Mesdag; Lille, Musée des Beaux-Arts; London, Courtauld Institute; London, National Gallery; Lyon, Musée des Beaux-Arts; Madrid, Thyssen-bornemisza Museum; Nantes; New York, Metropolitan Museum of Art; Paris, Musée du Louvre; Pontoise; Portland Art Museum; Rennes, Musée des Beaux-Arts; St. Petersburg, Hermitage; State College, PA, Palmer Museum of Art; Strasbourg; Valenciennes, Musée des Beaux-Arts.